October 12, 2018 By Denny Hansen & filed under All Articles, Rifles & Carbines, Weapons. Gary Smith, Gunsite long-range rifle instructor, fires Kimber AT SOC II. Kimber Advanced Tactical SOC II as it arrives from factory. Rifle uses Model 70-type three-position wing safety. Forward position fire, center position bolt can be worked but not fired. Rear position bolt is locked. 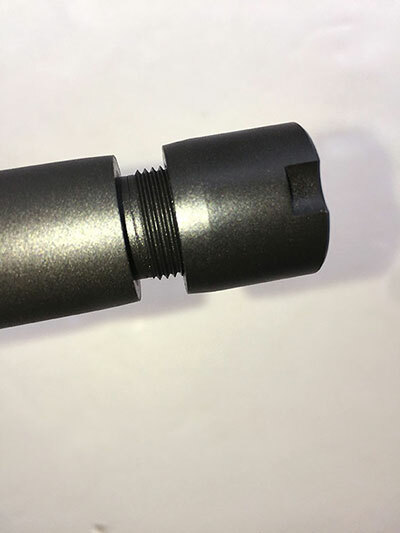 Muzzle is thread for flash hider, suppressor, or other muzzle device. Cap is included to protect the threads. Built-in bubble level is found at rear of receiver. UNS (night vision) is mounted forward on the barrel. Slots are M-LOK compatible. 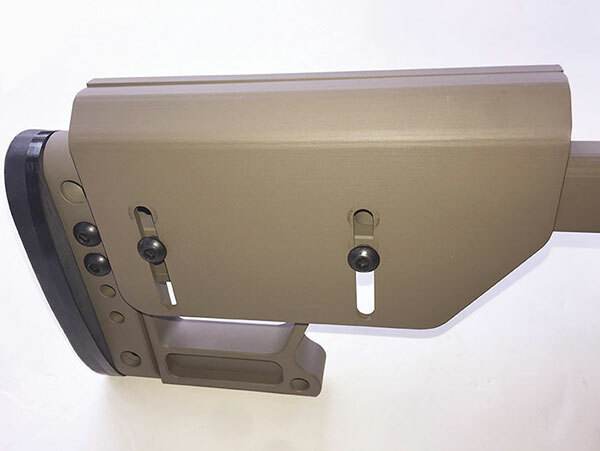 Stock is fully adjustable to fit individual users. Cheek piece is adjustable for height. 1913 milspec tripod mount is standard. Teardrop-shaped bolt knob is smooth and large enough to permit quick and sure manipulation. Kimber AT SOC II uses proven AICS-type five-round magazine. Stock partially folded. When opened, it locked up solidly, with no play. At the SHOT Show four years ago, Dwight Van Brunt, who headed up media relations for Kimber, showed me a new tactical rifle Kimber was introducing. I placed an order for a T&E (test and evaluation) rifle. But Dwight retired from Kimber before the order went through, and I forgot about the rifle. While fact checking some information on Kimber’s website for an article that was submitted to S.W.A.T., I spotted the long-forgotten rifle—the Kimber Advanced Tactical SOC II (AT SOC). Since I have never seen it covered anywhere else, I requested a T&E sample for S.W.A.T. in Flat Dark Earth. The Kimber Advanced Tactical SOC (Special Operation Capable) II has been built from the ground up as a precision tactical rifle. Available in both .308 Winchester and 6.5 Creedmoor, the sample rifle was chambered for the former. The rifle arrived in a very nice nylon case with numerous pockets and pouches. Both ends of the front of the case feature MOLLE webbing in the event more gear needs to be attached. As is, it should be able to contain everything a rifleman may need, such as binoculars, spotting scope, laser rangefinder, weather meter, etc. The AT SOC II is on the heavy side, weighing in at 11.5 pounds, although many other precision rifles weigh more. The length is fully user adjustable. The action is stainless steel and finished in Kimber’s matte black KimPro II. Capacity of the AICS magazine is five rounds. It features the proven Mauser claw extractor and a Model 70-type three-position wing safety (forward position fire, center position bolt can be worked but not fired, rear position bolt is locked). Factory trigger setting is 2.5 pounds. The teardrop-shaped bolt knob is smooth and large enough to permit quick and sure manipulation. The 22-inch stainless steel barrel has a 1:10 twist and is also finished in matte black KimPro II. 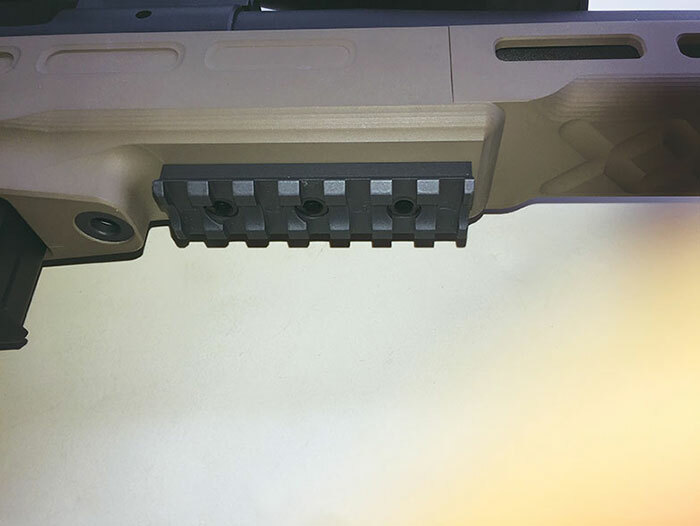 It has a match chamber, and the muzzle is threaded for a suppressor or other muzzle device. The aluminum stock is fully adjustable for length, drop at the heel and at the comb. For transport, the stock folds to the left. 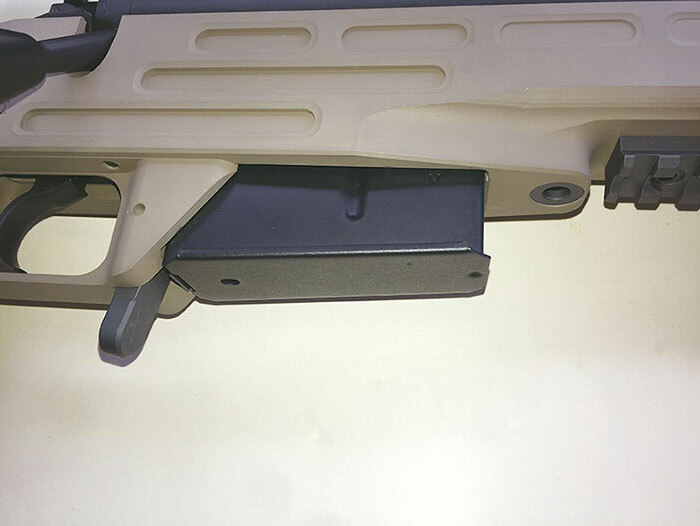 A stock pack is included with the rifle and contains Allen wrenches to adjust the stock. For lack of a better term, a hook extends down for the support hand. 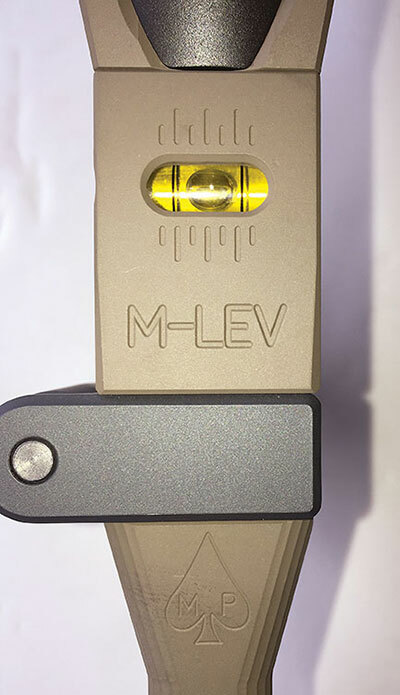 A built-in bubble level is found at the rear of receiver. A night-vision mount is standard, as is a 1913 milspec tripod mount just forward of the magazine. A single stud for attaching a bipod is provided. 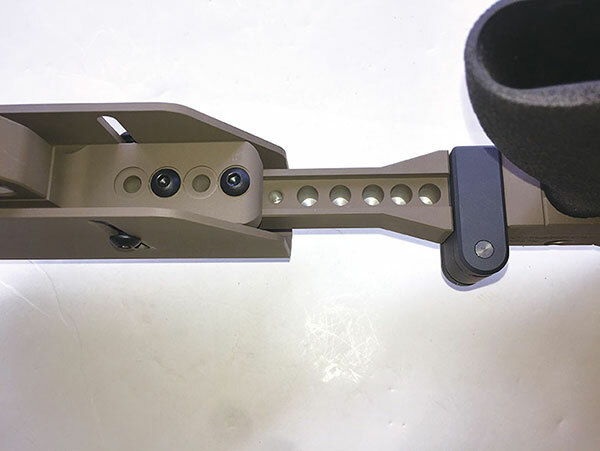 There are two sockets for push-button-type sling swivels—one at the front of the stock and one at the end of the stock. 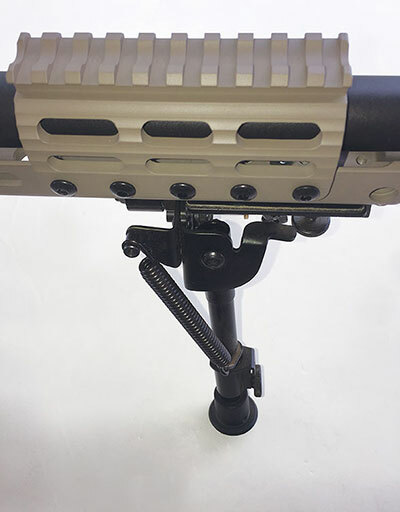 At three and nine o’clock on the handguard and the UNS mount are three slots that are M-LOK compatible. Kimber guarantees sub .5 MOA accuracy. Of course, this means with quality, preferably match, ammunition, not some Portuguese surplus. I learned long ago that the rifle is only one part of a three-pronged equation for precision. The other two are ammo and glass. For the optic, I chose the Burris XTR II 4-20X50 with G2B mil-dot reticle. Click values were in 1/10 mils. Using a Wheeler “Fat Wrench” torque wrench, the bases were attached to the rail with 40 inch-pounds of torque. The XTR II is a front-focal-plane reticle design, and trajectory compensation is always correct and proportional for the selected power setting. This high-performance optic offers Hi-Lume® multi-coated lenses, which optimize target resolution, contrast, and low-light performance. Total elevation adjustment available is 90 MOA with 55 MOA windage. Eye relief is 3.50 to 4.25 inches. Zero Click Stop adjustment knobs let you quickly and easily revert back to the original yardage setting without counting clicks. The side-mounted parallax adjustment can be set from 50 yards to infinity. The XTR II has an illuminated reticle with 11 brightness settings. Measuring 14.9 inches and weighing 30.90 ounces, this is a heavy-duty scope. I also added a Harris HRBS bipod. The legs on this model extend from six to nine inches and tilt to compensate for uneven terrain. 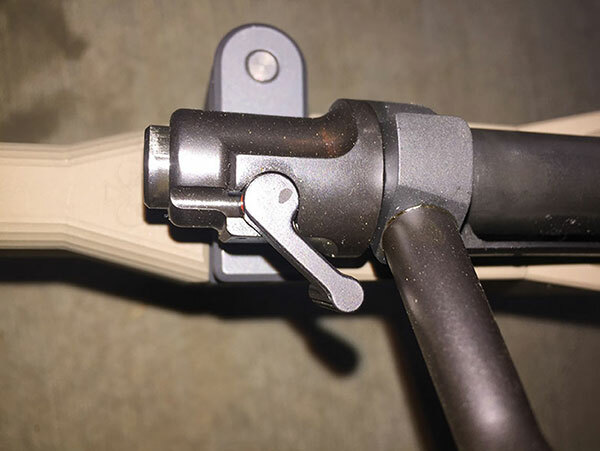 A lever at the rear of the bipod locks the swivel feature. The bipod adds another 13 ounces to the rifle. Fully equipped as tested, the rifle weighed 13.74 pounds unloaded. The good news was that fire restrictions had been lifted in my area due to the heavy Arizona monsoons. The bad news was that my range had been turned into a quagmire due to the heavy Arizona monsoons. Ken Campbell, Chief Operating Officer at Gunsite Academy, graciously offered to let me test the AT SOC on one of Gunsite’s rifle ranges. I arrived at Gunsite with four loads that have proven accurate in past evaluations of precision rifles. These loads included Black Hills Match 175-grain BTHP, Federal Match 168-grain BTHP, and Hornady Match 178-grain BTHP. 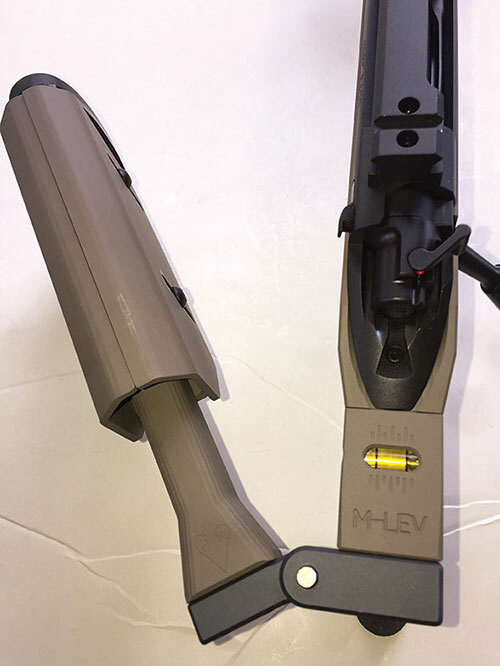 I’m not a fan of many folding stocks, as they tend not to lock up tight and instead allow some movement, translating into a less-than-optimal shooting platform. This was not the case with the stock on the AT SOC II. It snapped into place with authority and was every bit as rigid as a non-folding stock. I can hold my own with a rifle but am admittedly not an expert shot. 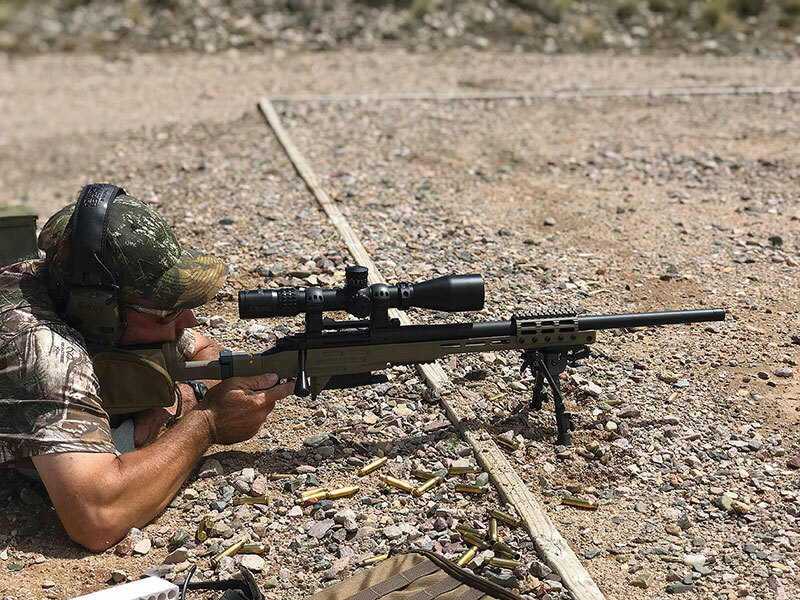 To see what the AT SOC II was fully capable of, I turned the rifle over to an expert—Gary Smith, one of Gunsite’s long-range rifle instructors. Settling in with the Harris bipod and a rear bag, Gary fired the first three-round group with the Federal match load. With a group that measured .66 inch center-to-center, with two rounds literally through the same hole, I envisioned a glowing report on the rifle. It would likely have met Kimber’s sub .5 MOA accuracy guarantee if fired from a bench. But I was disappointed—and frankly very surprised—at the other two .308 loads. Inexplicably, the Hornady turned in a group that measured 1.44 inches, and the Black Hills measured 3.06 inches. As mentioned previously, these loads have proven very accurate in other rifles. This confirms my belief that firearms—especially shotguns and precision rifles—are finicky. This is usually neither the fault of the ammunition nor the firearm. Experiment to find the ammo your rifle likes and stick to it. To be on the safe side and if it’s feasible, buy a quantity from the same lot number, as it is not uncommon for manufacturers to change some components in any given load. The Kimber Advanced Tactical SOC II is loaded from the factory with features that often must be added on at extra expense with other rifles. Using the right ammunition, it is easily 1 MOA, if not the .5 MOA that Kimber guarantees. The price is in line with other factory precision rifles in its class, and much less than custom rifles. 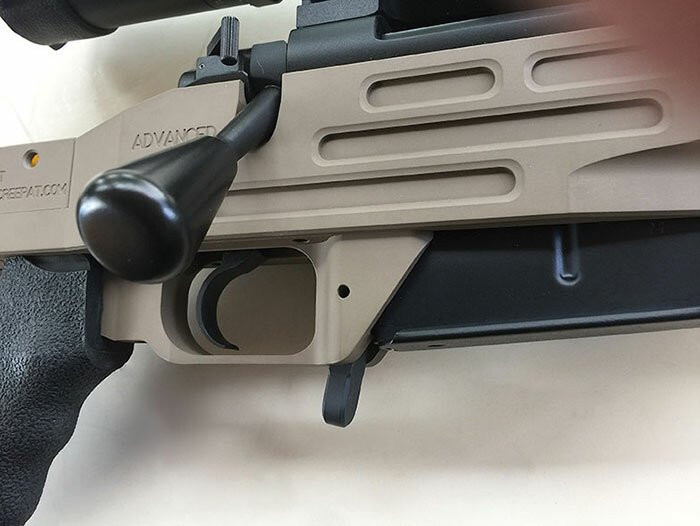 If you have been looking for a tactical precision rifle that is ready to go after mounting a scope, look no further than the Advanced Tactical SOC II.